Fashionâ€™s Night Out: Stores Open in Our Area! Fashion's Night Out is here! Still grieving the loss of the DSW? Well, a Fashion’s Night Out might be just what you’re looking for. As retailers around our area offer up a dose of late night retail therapy. 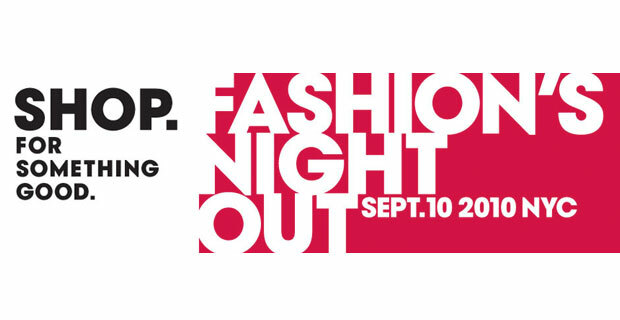 Fashion’s Night Out is a joint venture between Conde Nast’s Vogue Magazine, The Council of Fashion Designers of America and NYC and Company in an effort to celebrate the fashion industry. Stores everywhere across the world will be open between 7-11PM on September 10th and will be offering cocktails, special items and even red carpet worthy events. On September 7th, the consortium will be holding the largest public fashion show in history at Lincoln Center. Tickets will be available while supplies last through the Lincoln Center box office at LincolnCenter.org. Event details pending, however we will be serving wine, snacks and we will feature informal modeling. As the date approaches we will let you know. Join us for a celebration of style. Shop the newest arrivals and receive shopping incentives full-priced merchandise all night long. Enjoy complimentary refreshments, while supplies last. One night only â€“ only at select Banana Republic NYC stores. Clarins invites you to a special Beauty Party to celebrate French glamour as only Clarins can! Each attendee will receive a complimentary complete makeover while enjoying refreshments and sweets at the Clarins Counter. Put your beauty in our hands at Fashion’s Night Out! CRUMBS Bake Shop will feature a special edition “Fashion’s Night Out” cupcake. The cupcake will debut on September 10th in all NYC stores and will be available through Fashion Week. A portion of sales from the cupcake will benefit the NYC AIDS Fund. EDUN is partnering with Scoop in their Meatpacking District “swing” store, creating an EDUN Pop Up Shop for the night. Jaleel from TV on the Radio will be DJing, with a special performance by the BLK JKS from South Africa. Enjoy a scoop of ice cream from an ice cream truck on site. Special guest DJs will be riding their bikes and participants will be encouraged to ride their bikes as well. Limited edition accessories from Kenya exclusive for Scoop will be on sale as well as the EDUN Fall Collection. Gift with purchase. 7 to 11 pm. From 6-9pm meet stylist, blogger & jeweloholic Beth Bernstein of B-Jeweled. She’ll be sharing tips on the hottest trends in jewelry and how to incorporate them into your personal style. Also, bid on exclusive silent auction items from designers including Anne Sportun, Jamie Joseph, Melissa Joy Manning and Shaesby, all proceeds to benefit breast cancer charity Susan G. Komen For the Cure. Special guests will include jewelry designers EXCLUSIVE: Score a studded leather Gorjana bracelet, ours exclusively, with any purchase of $250 or more. Food & refreshments will be served. In honor of our Coffee-themed Menâ€™s collection, we are turning tribeca ISSEY MIYAKE into CafÃ© ISSEY MIYAKE. Enjoy free coffee & latte art by the expert baristas of La Colombe with Mille Crepes by Lady M and special cocktails. Hear music by DJ Keiichiro, shop the new collections, and watch the latest fashion show. Guests will be able to purchase an exclusive Issey Miyake Cafe Shirt. Receive a limited edition ISSEY MIYAKE coffee cup & 1lb of La Colombe coffee with any collection purchase. All guests will receive a free gift & can enter a raffle to win a collectable Pleats Please Bilbao Bag. La Lumia’s “Fashion’s Night Out” event will be hosted by owner, Jackie Sencion, from 4pm to 9pm. We will have wine and cheese for our guests. Shoppers will be entered in a raffle for any purchase of $150 or more. The prize is a beautiful LaLu Leathers co-op hand-crafted cognac colored genuine leather handbag valued at $595. This event is open to the public. OTTE Will be hosting a one-year anniversary party at their newest location in TriBeCa. Light refreshments will be served as well as a store-wide sale on all merchandise, and all attendees will be eligible to win a $500 gift card! Be sure to visit participating businesses in the area for other exclusive deals and special events. Please stop by and meet our designer Sabina Les and see new Fall/Holiday line of our original textile scarves at Bloomingdales on 59th Street, NYC. Designer Sabina Les is looking forward to give you her styling tips on how to wear scarves in many ways. Our scarves make perfect gifts for the upcoming holidays and special events. Stephen Seo Collection cat walk on Madison Ave with 8 models for brand awareness. Models will be handing out look books. The Designer will be in his luxury exotic car near by models. Appearances by Steven Alan and other designers. Discounts on exclusive items available for Fashion’s Night Out only. Additional event details to follow. Thanks, for a girl loves fashion it is so useful. Will try to find them all.